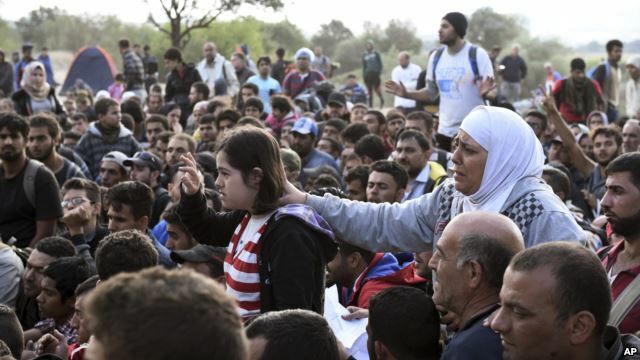 The stream of refugees into Europe continued Monday. The passage through Hungary is much smoother than it was last week, when the central European nation seemed ready to do whatever it could to prevent the migrants from entering the wealthier western European nations. Hungarians are now posting Austrian train schedules for the refugees at Budapest's Keleti station. Last week, police tear-gassed the migrants at Keleti who wanted to go Austria. One observer said the trains to Austria are now "just loaded" with migrants. Upon their arrival at Vienna's Westbahnhof train station, the refugees are met with applause from Austrians who efficiently guide the travelers from one train to another in their journey to Germany. Very few of the refugees are opting to stay in Austria. Many of the migrants already have relatives in Germany who are urging them to join their families there. Germany – Europe's wealthiest country – said Monday it is making an additional $6.6 billion in public funds available next year to absorb the refugees into German society. Germany has said it is willing to accept 800,000 migrants. The newly arrived refugees are communicating through their cellphones and their Facebook pages with relatives and friends who are further back in the immigration pipeline to inform them of what to expect on their journey to Europe. For example, Budapest is currently a good jumping-off point for entry, but migrants are warning their loved ones that could be short-lived. The train ride from Budapest to Vienna is not exactly comfortable, as refugees have to wait in long lines, but at least the journey is possible, which it was not last week. However, Austria has said it plans to lift the emergency measure that has made that route relatively easy. Other information in the pipeline that could change soon includes a number of holes and gaps in the razor fence at the Hungary/Serbian border. Hungary said it intends to patch the holes, but, for now, refugees are streaming through.